While there are in fact a number of possible electrification solutions available to the semi truck and heavy-duty truck operators out there already, the sector still stands to open up considerably more over the coming decade as various major manufacturers begin releasing new products. I’ll take a quick detour here, though, before continuing with that line of thought. In some niche uses — garbage trucks, in particular — plug-in electric vehicles are already highly economical. Hence the rapid rate of electric refuse/garbage truck adoption in China in recent years, and the beginning of a possibly wide rollout in the US and Europe. This is due to the start-stop nature of refuse/garbage truck operation — a use-pattern that is ideally suited to the utilization of electric vehicles outfitted with regenerative braking. Diesel or petrol/gas-powered garbage or refuse trucks are essentially some of the least energy efficient vehicles out there — so it’s a “low hanging fruit” segment as regards electrification. Going back to the broader subject at hand, there are many heavy-duty truck applications where plug-in electrification will make a lot of economic sense shortly (if it doesn’t already), and a few where it will require a great deal of infrastructural change and support if it’s going to happen. On this last count, I’m mostly talking about long-haul trucking — where a successful rollout of all-electric semi trucks will require a vast, comprehensive rollout of fast-charging infrastructure, accompanied by adjacent support facilities (food, sanitation, etc.). That’s not to say that it can’t be done, simply that it won’t be a trivial thing to accomplish. With all of that in mind, I’m going to do a quick overview of the options out there now, before going on to spend more time on the — generally more substantial — models that are due to hit the market in the coming years. Efficient Drivetrains Inc (EDI) currently offers a number of plug-in hybrid and all-election retrofits for various medium- and heavy-duty truck applications worldwide. Much of the company’s business to date could arguably be said to be coming from China — where the adoption of plug-in electric truck technologies seems to be a fair bit higher than elsewhere (due to air pollution problems and increasingly strict regulations). Amongst the various Class 8 plug-in electric and hybrid solutions (the EDI PowerDrive 8000 product series) that it now offers is a Class 8, 32-ton plug-in hybrid electric (PHEV) cement mixer truck released in partnership with Shaanxi Automotive in China. That offering represents the world’s first Class 8, zero-emissions-capable cement mixer truck in the world, apparently. Field deployment in China of this offering reportedly begins or began in late 2017. Orange EV is best known for the T-Series terminal truck (yard truck, yard jockey, etc.) that it sells. The all-electric terminal trucks have been adopted by a fair number of municipalities in the US to date, owing to the low operating costs and non-existent emissions. Amongst the largest customers to date is the intermodal rail yard operator Rail Management Services — which has purchased 10 units of the Orange EV T-Series yard truck so far. The company currently offers a number of different configurations, suited to meet the needs of different sites while remaining economical. The orders from RMS, for instance, were of the Extended Duty (160 kilowatt-hour/kWh battery pack outfitted) versions — composed of galvanized frames. The options are there to adjust for on-road or off-road use, and for standard onboard charging or off-board fast charging. Orange EV provided estimates to RMS stating that the use of one truck in rail intermodal hub operations would displace around 160 tons of CO2 emissions, 1.7 tons of NOx emissions, 1.6 tons of CO emissions, and 80 kg of particulate matter emissions per year. 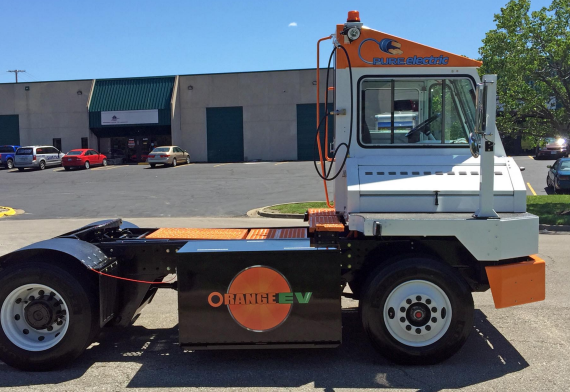 Motiv Power Systems currently sells the Motiv All-Electric Powertrain, which is used in a number of Class 8 all-electric refuse/garbage vehicles (ERVs), amongst other things. The company will soon deploy a few all-electric, zero-emissions garbage trucks in the City of Los Angeles, for instance, as part of a demonstration project. These trucks — utilizing the Motiv All-Electric Powertrain combined with a Crane Carrier chassis and an automated side-loader body built from Amrep — will reportedly possess a payload capacity of 9 tons, and 1,000 pounds per cubic yard of compaction. They will be entirely powered by battery packs up to 212 kWh in capacity and designed to go a full work day on a single charge. Delivery is expected in early 2018, and the use of the trucks is expected to curtail fuel use by some 6,000 gallons per year (with local emissions and pollution being affected concurrently). Once deployed, Motiv Power Systems will only have 4 ERV units deployed in North America in total. BYD has to date deployed a significantly higher number of plug-in electric trucks than most of its competitors have — mostly on the back of strong demand in China and competitive pricing/running costs. In the US and Canada, though, sales have also been growing — with the company now even planning a new assembly facility in Ontario (to open in 2018) in expectation of surging demand there. In relation to that, BYD and the largest grocer in Canada, Loblaw, recently unveiled a 53-foot, Class 8 all-electric truck that’s meant to be a sign of things to come as the grocer electrifies its fleet over the coming decade. 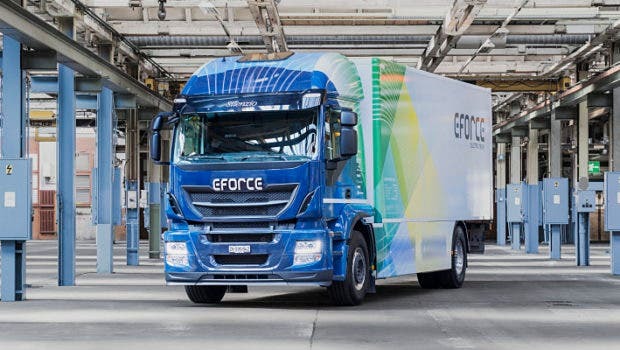 The units possess a single-charge range of 92 miles (148 kilometers); a gross combination weight rating of 120,000 pounds (around 54,000 kilograms); and onboard hybrid refrigerated trailers. Elsewhere, BYD recently began the largest deployment of all-electric heavy-duty trucks in the US to date — 23 Class 8 yard trucks and 4 Class 5 service trucks in California — in partnership with Daylight Transport, the California Air Resources Board, and the San Bernardino Council of Governments. 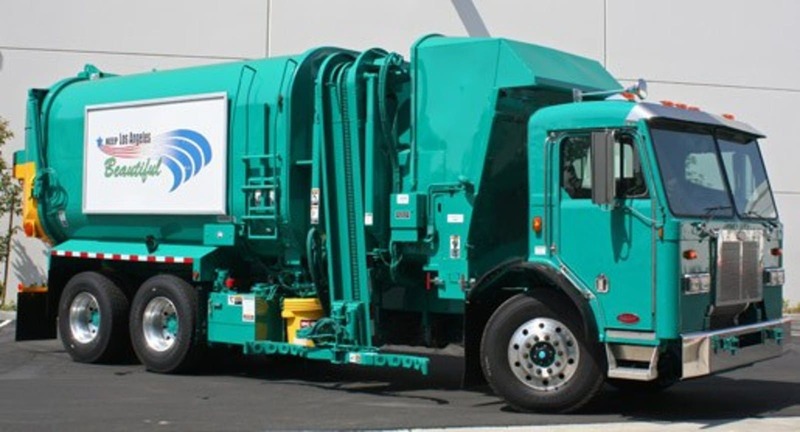 The company also recently deployed an all-electric automated side-loader garbage/refuse truck in the City of Palo Alto in California, via the city’s waste management firm GreenWaste. This BYD electric truck possesses a range of 76 miles per single charge (via a 178 kWh battery pack); a payload rating of 18,820 lbs; and a 2–3 hour charging time. Annual savings for GreenWaste and the City of Palo Alto as a result of the deployment are expected to total ~$16,000 — on the back of reduced brake wear, less overall maintenance, and lower energy/fuel costs. 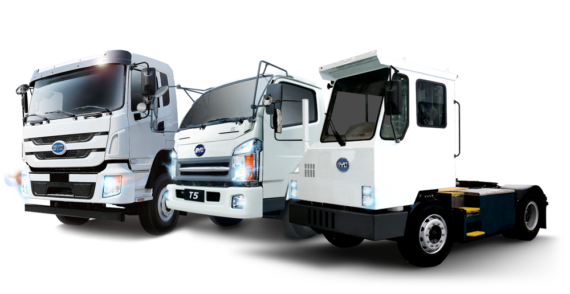 Perhaps much more notable than that deployment, though, was the recent launch of a full lineup of all-electric sanitation trucks by BYD in China — in cooperation with the Beijing Environmental Sanitation Engineering Group. This lineup of all-electric sanitation trucks is composed of 26 different models and will be used to replace around 100% of the group’s fleet by the end of the year. The lineup spans just about every aspect of the industry — with the inclusion of garbage/refuse trucks, street sweepers, sprinkling trucks, refrigerated trucks for hazardous waste transfer, etc. Collection, disposal, and transportation services will all be provided for by the lineup — while reducing air pollution, noise, and operating costs. The bodies of the new electric trucks are composed of lightweight aluminum; the trucks can be fully charged in just 2–3 hours; single-charge range is some 400 kilometers or 8 hours of heavy-duty operation; GPS is included; vehicle-to-vehicle power transfer is a feature; and the trucks feature a camera system providing a 360° view around the units. Wrightspeed, a company founded by a Tesla cofounder Ian Wright, currently offers a number of plug-in hybrid powertrains for use in heavy-duty, stop-start style usages (primarily). The company’s products reportedly provide a return-on-investment (ROI) period of ~4 years, and the ability to reduce fuel consumption and emissions by over 50% (as compared to conventional petrol powertrains). Something that’s interesting is that the company accomplishes this through the use of electric motors paired with an in-house developed micro-turbine that can run a very wide variety of fuel types (compressed natural gas, liquid propane, diesel, liquid natural gas, and even sour gas). This turbine powers the battery packs, functioning essentially as a component in a series-hybrid — and provides efficiencies similar to those used in high-end, top-quality gasoline piston range extenders. As this microturbine features only 1 moving part and 2 bearings, maintenance is simple and cheap. Something else notable about Wrightspeed’s solution is the use of Toshiba’s lithium-titanate (LTO) batteries, making the company something of an outlier in the electric vehicle sector. Lithium-titanate batteries can charge at temperatures as low as -30° Celsius, don’t need a heating circuit, and are highly regarded for their durability and very high resistance to catching fire. According to Wrightspeed, the company’s solutions provide: up to a 67% reduction in fuel consumption; up to a 63% cut in emissions; and up to $25,000 in reduced annual maintenance costs. The solution, of course, also makes the converted trucks in question very quiet as compared to diesel trucks and greatly reduces the need for brake pad changes (and thus reduces the air pollution resulting from brake wear). Wrightspeed is currently focused on the North American market. E-Force One is a company based out of Switzerland that has developed an all-electric 18-ton truck called the E-Force. With a single-charge range of around 300 kilometers per charge, the model is intended as a competitor to diesel trucks of a similar size operating in Europe that provide urban and near-regional transport and shipping services. The model reportedly only uses around 80–110 kilowatt-hours (kWh) of electricity per 100 kilometers traveled at highway speeds, which would make it fairly aerodynamic for such a large vehicle. Urban use reportedly results in a figure of around 60–90 kWh per 100 kilometers traveled. 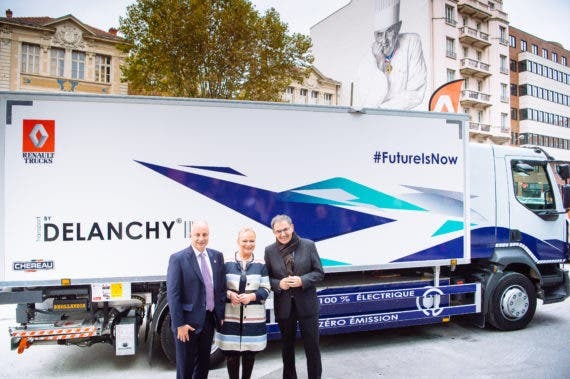 While perhaps arguably not a heavy truck, Renault’s and Groupe Delanchy’s recently unveiled new all-electric, produce delivery refrigerated box truck is worth highlighting here. The 13-tonne truck was designed with regional produce delivery in mind and features a Carrier refrigeration unit — and as part of a trial of the idea will be used by Groupe Delanchy to deliver fresh produce to Les Halles de Lyon Paul Bocuse in Lyon (the largest covered food market in France). I suppose that it’s also worth mentioning so-called “milk floats,” as they were a common sight in some parts of the world throughout much of the last century or so. 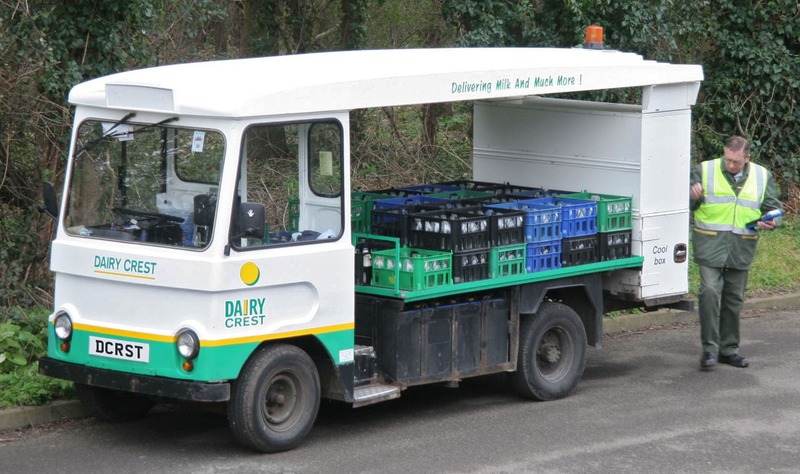 Owing to the vehicle use patterns of a milk delivery man, fleet operators sensibly often relied upon plug-in electric vehicles rather than internal combustion engine (ICE) vehicles. This was true even without the use of regenerative braking technology. The simply truth is that electric vehicles function much better in short-range, stop-start applications than ICE vehicles do (which would otherwise waste large amounts of energy/fuel idling). While not exactly “heavy-duty” trucks, they seem worth mentioning here anyways. The Tesla Semi is a 300-mile to 500-mile, all-electric Class 8 semi truck planned for release by the modern electric vehicle pioneer Tesla in 2019. The Tesla Semi will reportedly be able to charge from 0% to 80% in just 30 minutes — making the model possibly practical for long-haul uses, so long as a comprehensive fast-charging network is built out first. Semi truck drivers will be required to stop for breaks more and more as safety monitoring efforts increase over the coming years, but the long-haul capability still only makes sense if the “megachargers” are located conveniently along routes the truckers are driving. Something very notable about the Tesla Semi is that it will outperform diesel semi trucks by a substantial margin when traveling on an uphill grade — and can also more easily maintain a safe speed when traveling downhill owing to the use of regenerative braking (which will also factor into range). Furthermore, it will reportedly be immune to jackknifing. As far as battery pack size, it’s an open question at this point — with capacity sizes of under 600 kWh for the 300-mile option, and under 1,000 kWh for the 500-mile option seeming likely (see this article). Part of the reason for the model’s seemingly unbelievable specs (by some people’s judgment), especially when one considers the price tag of “only” $150,000 to $180,000, is that the semi possesses a drag coefficient of just 0.36 — which is actually better than some sports cars and vastly better than most heavy trucks. It’s that “very wet” drag coefficient that will allow the Tesla Semi Truck to achieve the sort of range figures being discussed while utilizing an affordable battery pack. The king of the North American semi truck field, Cummins is reportedly working on a Class 7 electric truck prototype named AEOS. The truck would have a 100-mile range, a 145 kWh battery pack, and a 22-ton haulage capacity. The model uses a 140 kW fast charger, allowing for a recharge time of only an hour, according to the company. Current plans don’t call for the new electric powertrain to go into production until 2019 (when Tesla says it will release its Semi), with the expectation being that recharge times can be slashed to around 20 minutes by then. Plans also call for an offering paired with an onboard diesel range-extending engine to be launched in 2020 — with a combined range of up to 300 miles and a fuel-consumption reduction of around 50% compared to conventional diesel hybrids. Cummings CEO Thomas Linebarger has in the past said that he doesn’t think the technology is there yet for a Class 8 electric truck that could do long-range work. Perhaps the Tesla Semi has changed his mind. 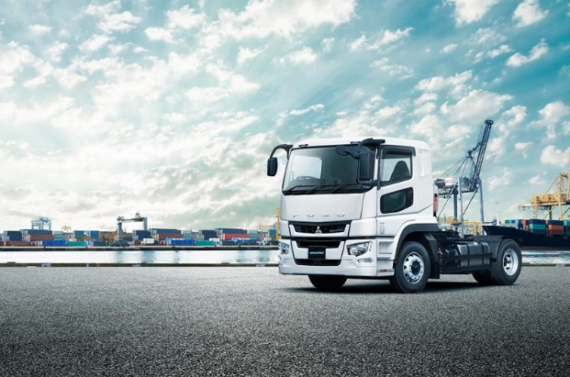 The E-Fuso One (Fuso is now owned by Daimler) is a prototype truck outfitted with a 300 kWh battery pack. It features a range of 220 miles (350 kilometers) and a cargo capacity of 11 tons (around 2 less than a comparable diesel truck). The Nikola Motor Company is a company that says that it will be releasing a Class 8 semi truck with over 1,000 horsepower and 2,000 pound-feet of torque. The truck will be based around the use of a custom-built hydrogen-electric 800V fuel cell drivetrain. The plan is reportedly for a launch by 2021. The offering will, according to the company, feature a range of over 1,200 miles and a fuel economy rating of around 20 MPGe. The heavy truck division of Volkswagen, MAN, will reportedly begin a test pilot of an electric semi truck through 9 of the top transportation companies in Austria (and the Council for Sustainable Logistics) by the end of 2017. The electric semi trucks in question will possess a gross vehicle weight rating (GVWR) of between 12 and 26 tons — with the results of the pilot being used to help MAN develop future offerings. 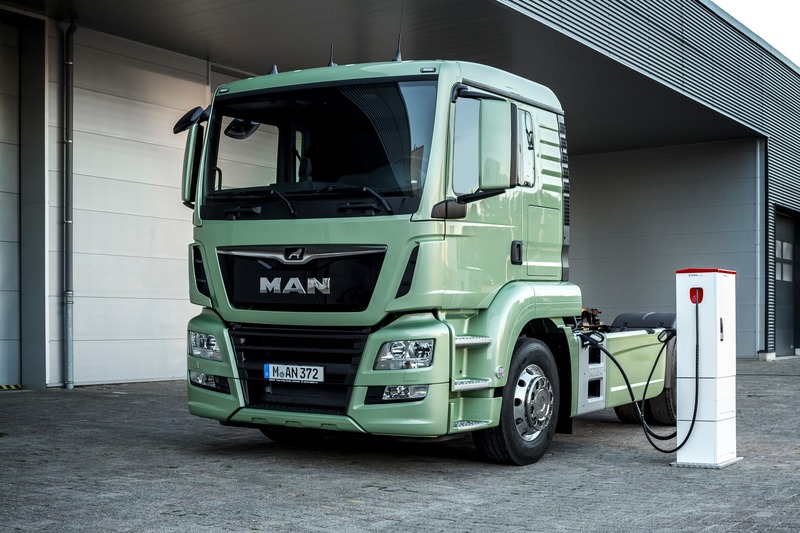 A tentative date for the market launch of an electric MAN semi truck is 2021. The truck’s range is up to 300 miles on a single charge (so, essentially the same as the lower-range Tesla Semi) at a price tag of around $150,000. Powertrain options range from 300 HP to 700 HP. Not many other specs have been provided. You can request a demo of the ET-One today.